This piece is a collaboration with Laura Maes. It was created for the Darkroom project, which investigated the effect of darkness on the brains and creativity of artists. 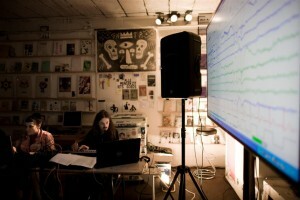 All sounds are based on an EEG scan of artist Hallveig Ágústsdóttir while she was drawing in the dark. in the neighbourhood of the foundation. transformed to the point where the original sound can’t be recognized anymore. premiered, which is loacted at Ham 145+, Gent. All sounds used in this electro-acoustic composition originate from four symbal samples. This samples were splitted in several layers using bandpassfilters, making the original cymbalsound irrecognisable. Editing of sounds was done using Soundscape and Samplitude, montage on Soundscape. This piece was made at the Logos electronic music studio. I started constructing the piece Processing #5 out of digital recordings of a large number of different kitchen knives and other cutlery. These appear both untreated and processed (stretching, filtering and reverb). The piece was edited on Soundscape and the digital processing of the sounds was done with Soundscape, Samplitude and Lexicon. This piece was made at the Logos electronic music studio. Processing #2 is an algorithmic composition. It is based on continuous five voice transformations of a theme never heard in its original form. A MIDI-recording was made of the original computer program, which had limited real time interaction possibilities. I chose particular patches on a Proteus EMU 100 synthesizer, that allowed me to add some envelope control of the sounds. Pitch, rhythm and panning are determined algorithmically. This piece was made at the Logos electronic music studio.